Can you imagine education without technology? In order to prepare the next generation for college and for their place in the workforce, it is very important that students and teachers embrace the benefits that modern instructional tools can provide. This is why thousands of educators answer the “call to action” and join the celebration of Digital Learning Day each February. A national event designed to allow educators to gather virtually to share and discuss the successes and challenges that they are experiencing with integrating digital tools in their classrooms. To help build this awareness and to promote enhanced instruction with modern technology tools, join us by participating in national Digital Learning Day which is scheduled for February 5, 2014! The online event will feature demonstrations, interactive lessons, presentations, resource sharing, tips, and even tricks designed for classroom educators that possess a passion for incorporating powerful digital tools into their lessons. Tweet out announcements from your classroom using the #DLDay and #emints tags! I hope to see you participating and making a difference with digital learning on Digital Learning Day! -Doug Caldwell, EdS, is an instructional specialist for the eMINTS National Center. 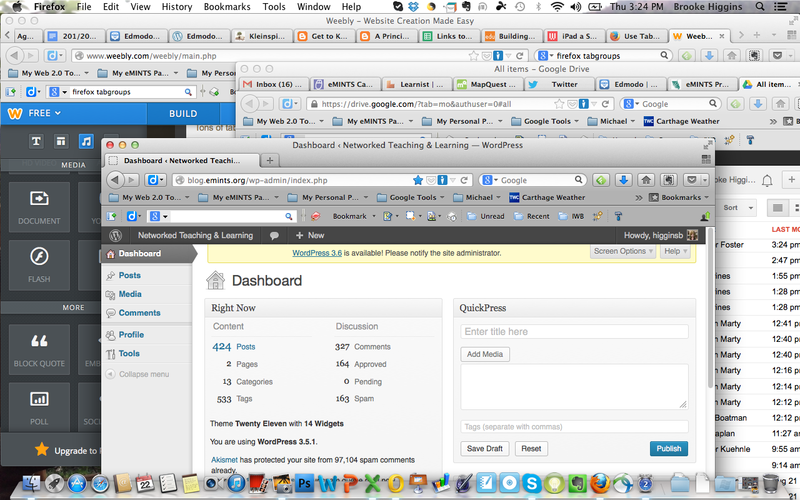 This was my browser workflow before finding Firefox Tab Groups…. 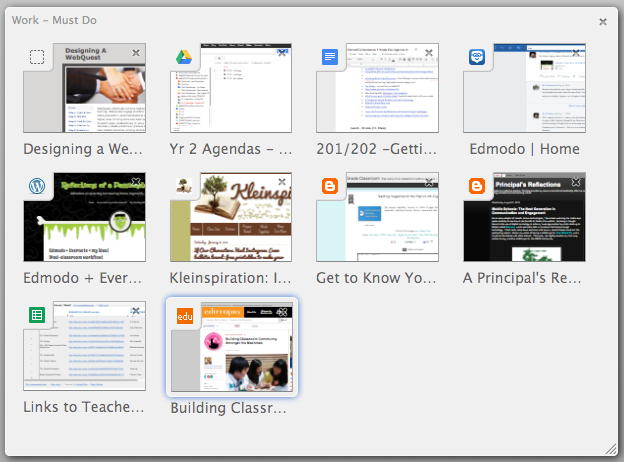 …enter stage right…my savior, my knight-in-shining-armor, my hero ….Firefox Tab Groups. I had the webpage with instructions in an open tab for more than a month before adding it to my “EXPLORE” list in my Outlook ToDo list. It took me a few more months before I had a week this summer to do some R&D and get back to that “EXPLORE” list. It was AMAZING, I read the instructions and made a couple of quick clicks, typed in a couple of names, and turned that crazy mess of windows and tabs into THIS (see below). It became a beautifully organized, gathering of websites sorted into groups of small images with titles all in ONE window. Ahhhh, sweet organization! How to Tame the BEAST: It’s pretty simple to set up, but the directions from Firefox didn’t work exactly as stated on the website under the “How do I create a tab group?” section. 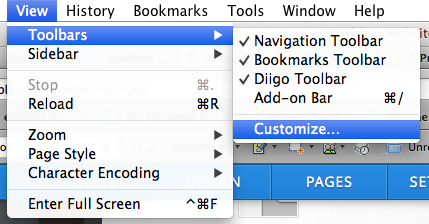 What I did was first add a couple of tabs, then selected “Customize” toolbar from the View>Toolbars drop-down menu. From there it was a piece of cake. I created new groups by double-clicking in the gray area to add a new tab in a new group. Then i named my groups by hovering over a group until the “Name this group” text field showed up (where you seem my “Work – Must Do” title) and then I typed in the name I wanted. Then I dragged the existing tabs around to the appropriate group and resized the group areas so that I could see a larger or smaller image of the tabs to help me identify them. I have 3 main groups, 2 for work and 1 personal group. When I am ready to start browsing I click on the tab I want front and center, notice all of the other tabs in that group are available in the same window. 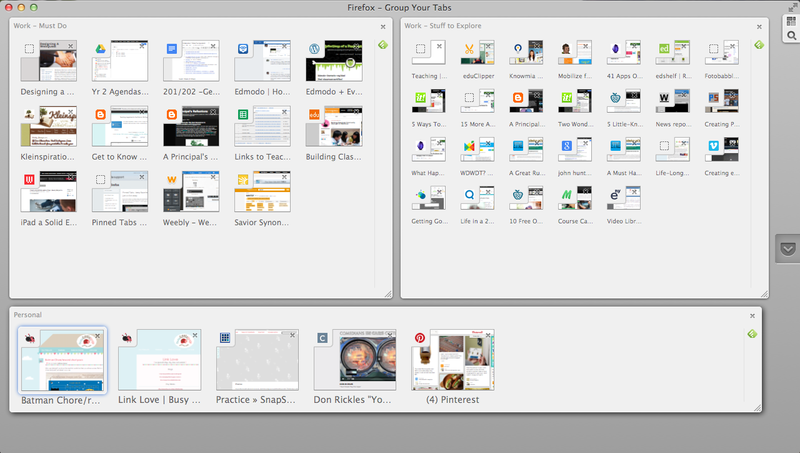 When I want to get back to view all the tab groups I just click the “Group Your Tabs” button in the top right corner of the Firefox window. You should practice going back and forth between tabs and groups but be careful because when it asks if you are sure you want to close the windows it means all of your Firefox windows. There are a few additional features such as searching and saving resources for reviewing later using Pocket. These instructions, and more, can be found on the Use Tab Groups Mozilla Support Page. All images captured by Brooke Higgins. Brooke Higgins, occasional blogger, is an eIS for the eMINTS National Center working with eMINTS teachers, trainers, and administrators. All of her posts, including this one, can be found at The Higgins Helps blog.